Share your Idea. Impact your City. Win Funding. We want to hear your ideas for making Baltimore a stronger, healthier, safer, smarter and more innovative and vibrant city. Submit a 60-second video sharing your innovation and how it will make Baltimore a better place! Be creative and think outside the box. 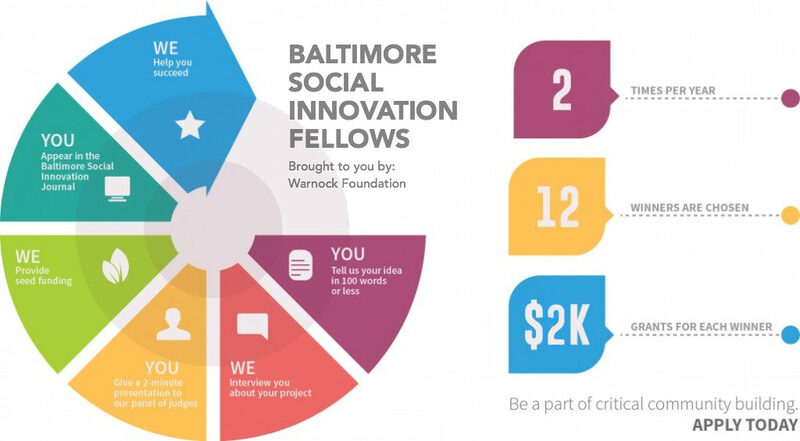 The Warnock Foundation Social Innovation (WFSI) Fellowship provides Baltimoreans with the opportunity to implement their ideas/innovation they believe will make Baltimore a vibrant city to live, learn and prosper! The WFSI fellowship provides a platform for our social innovators to be heard and impactful. Through the WSFI fellowship, fellows are provided leadership development, business education, funding, and advisement. The overarching goal is to utilize the talent that already exists in Baltimore to grow and guide them to creating innovations that will impact their community and city. Applicants will submit 100 words or less and a 60-second video sharing their innovation and how it will make Baltimore a better place! Be creative and think outside the box. Applications will be reviewed by a committee, who will select 24 finalists. Finalists will be invited to an interview with the committee. The Warnock Foundation seeks innovative and determined applicants who see opportunities within Baltimore and is looking to invest their time and energy in making Baltimore a vibrant, growing and innovative city. The Warnock foundation is looking for applicants who sees a solution rooted in Baltimore and is willing to dedicate their time and talents to make the solution a reality. What does The Warnock Social Innovation Fellowship offer? Attend workshops and sessions allowing innovators to learn from Top CEO’s, entrepreneurs, and other social business leaders. Given the opportunity to create editorial features for the Warnock Foundation blog. Featured in the Social Innovation Journal. Utilize advisors and business leaders to develop strategies to grow and sustain their innovation. A huge part of the fellowship will teach innovators how to effectively build sustainable networks to enhance their innovation. 12 innovators will be accepted into each Social Innovation Fellowship cohort. Cohorts start in the spring and fall of each year. Workshops and sessions allowing innovators to learn from Top CEO’s, entrepreneurs, and other social business leaders. The Warnock Foundation believes that innovators that are selected can have a significant impact on our fantastic city. As a Warnock Social Innovation Fellow, you will be required to attend six educational sessions and attend at least two corporate leadership sessions over three months. Dates of those sessions will be provided to you upon being accepted as a fellow.